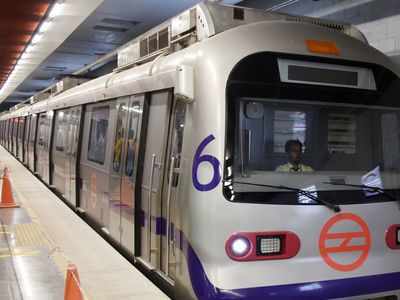 NEW DELHI: With the metro network expanding vastly over the last two years, the growing number of stations has also meant an increase in non-fare revenue for Delhi Metro Rail Corporation. Auctioning of semi-naming rights of many stations is turning out to be the leading non-fare revenue generator for the corporation. DMRC managing director Mangu Singh told TOI that non-fare revenue has been going up in the last few years mainly because DMRC has been expanding its network at a fanatic pace as part of the Phase III project. Excluding the Noida-Greater Noida section, which too has been built by the corporation, the entire metro network currently stands at 343 km with 251 stations. In a reply to an RTI application, DMRC revealed that it earned Rs 441.4 crore in non-fare box revenue in the financial year 2015-16, Rs 477.5 crore in 2016-17 and Rs 502.7 crore in 2017-18. The figures for the financial year 2018-19 are not yet available. “Naming right has been quite successful,” an exuberant Singh told TOI in a recent interview. “On an average, we get around Rs 1 crore per station per year while some stations give almost Rs 2.5 crore per year, which is really good,” he added. The DMRC MD said that apart from generating direct revenue through auctioning of naming rights, it also has added benefits. At most stations, the undertakings that have bought the naming right, also do the branding of the stations with colours associated with the respective companies. Singh claimed that this adds to the aesthetic of the station. Also, with the company maintaining the exterior of the stations, DMRC doesn’t have to worry about maintaining it. “We save on maintenance of these structures and also lighting and other aspects. It’s a good thing,” he said, while adding that the revenue earned is fully used to pay back the loan taken from the Japan International Cooperation Agency. 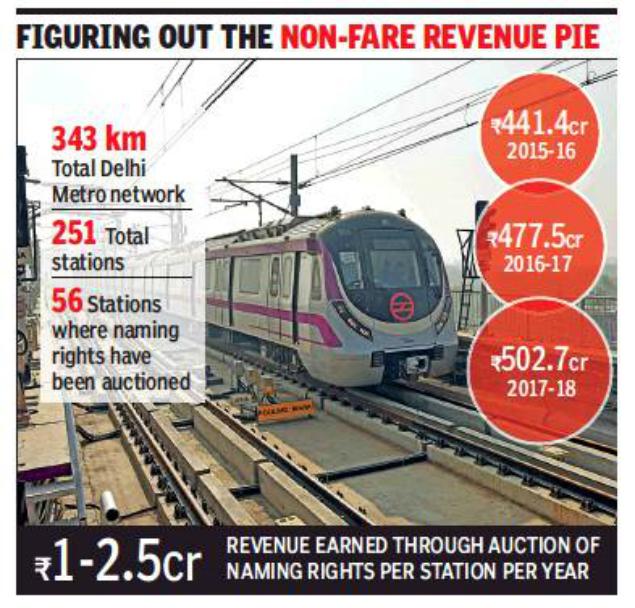 From 2014, DMRC started auctioning naming rights of select stations to companies and public sector undertakings, which has been helping it in generating substantial revenue. DMRC has auctioned naming rights for a total 56 stations across NCR in the last five years. The corporation’s initial foray into co-branding had been in NCR areas falling under Haryana and Uttar Pradesh, as sources said that policies in these states are not very restrictive regarding branding of stations. The beginning was made in Delhi with the ITO and Vishwavidyalaya metro stations.